The 21 Day Writing Challenge – Tell Your Inner Critic to Take a Backseat – Lead. Learn. Grow. I was reading a post from @ElitaTorres1 earlier this week that both inspired and challenged me. She blogged about the 21 Day Writing Challenge. I was intrigued but immediately began to question whether this was something I could actually complete. I’ve always loved writing. However with my hectic high school assistant principal schedule and family, my inner critic had me questioning if this was something to which I could truly commit. I love quotes. 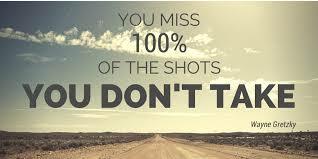 In that moment of hesitation Wayne Gretzky’s famous quote came to mind, “You miss 100% of the shots you don’t take.” My inner critic was fully prepared to limit and shut down an amazing opportunity for me to grow as a person, a writer, an educator and a leader. Being completely vulnerable in this post, I’m learning to embrace failure. I love the idea of “failing forward” but I hate the feeling of not being at my best or knowing I didn’t meet the mark. This is an area of personal and professional growth. So what if I miss a day? Is 14 days of writing and reflecting less impactful? Are the ideas shared from 12 days of writing nullified because I didn’t write all 15 days? I’m learning to give myself some grace and to tell my inner critic to take a backseat. This was a small challenge but one that made me reflect. It pushed me outside of my comfort zone and forced some additional introspection. Here are the conditions of the 21 Day Writing Challenge. I hope you will join me in accepting the challenge (regardless of your inner critic). Post once per day, 5 days per week. Continue posting 5 days per week for 21 days, totaling 15 posts. Each post must be a minimum of 500 words. Posts must be written and not dictated. Writing the posts myself will help build the habit. Make a list of topics that you want to write about. Keep it up. We will inspire each other.